18:2 - Humanities Research Issue 34:3 - How do Asian Americans Create Places? 21:1/2 - Thinking Theory in Asian American Studies 36:1 - Asian and Pacific Passages: "The Migrant with a Thousand Faces"
* All issues listed above are available for purchase. For more information on purchases and subscriptions, please click here. The inaugural issue examines the topic of community development by policy advocates and applied social scientists from across the nation with editors Paul M. Ong and Don T. Nakanishi. Authors: Kil Huh and Lisa Hasegawa, Dean S. Toji and Karen Umemoto, Melany de la Cruz and Loh-Sze Leung, Douglas Miller and Douglas Houston, Grace Yoo. Most of the articles in this issue were originally produced for a strategic roundtable held in October 2002, co-sponsored by the Civil Rights Project at Harvard University and the UCLA Asian American Studies Center. Authors: Karen K. Narasaki and June K. Han, Peter Nien-chu Kiang, Claire Jean Kim, Rowena Robles, Paul M. Ong. Politicians, political activists, and professors contributed commentaries, policy research reports, and detailed accounts of exit polls and voting rights compliance strategies that can be used in AAPI communities. Authors: S.B. Woo, James Dien Bui, Shirley Suet-ling Tang and Peter Nien-chu Kiang, Tarry Hum, Janelle S. Wong, Daniel Kikuo Ichinose, Glenn D. Magpantay. Little is know about these health problems, which include high levels of cancer, cardiovascular disease and diabetes, and what is known is not widely disseminated. 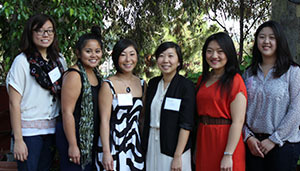 This issues examines health problems of Asian Americans and Pacific Islanders. Authors: Marjorie Kagawa-Singer, Paul M. Ong, Julia Liou, Sherry Hirota, Hongtu Chen, Elizabeth J. Kramer, Teddy Chen, Jianping Chen, Henry Chung, Cecilia Chen, Doug Brugge, Alice Leung, Andrea Finkelman, Weibo Lu, Will Rand, Lisa Sun-Hee Park, David Naguib Pellow, Chi-kan Richard Hung. Scholars, researchers, practitioners, and government officials within this volume examine racial discrimination in employment against Asian Americans, workers' rights, and economic parity in the global labor market. Authors: Stuart J. Ishimaru, Karin Mak and Grace Meng, Don Mar, Paula Chakravartty, Julian Chun-Chung Chow, Kathy Lemon Osterling and Qingwen Xu, Siri Thanasombat and John Trasvina. This issue examines whether there is a "glass ceiling" affecting Asian American professionals. Health issues also are addressed. Authors: Vu H. Pham, Lauren Emiko Hokoyama, Arthur Sakamoto, Hyeyoung Woo, Keng-Loong Yap, Jeremy S. Wu, Carson K. Eoyang, David T. Takeuchi, Seunghye Hong, Ninez A. Ponce, Melissa Gatchell, Laurent S. Tao, Jini Han, and Ami N. Shah. There is no question that adolescent violence and related risk behaviors are a serious problem in the U.S. today. Over the past several decades, there has been a concerted effort to identify factors that pose a risk for or serve as protection against delinquency and violence using large sample and longitudinal studies of youth. Together, the articles in this special issue of AAPI Nexus belie the simplistic "whiz kid" stereotypes. "These articles," says Umemoto, "contribute to the critical conversation on the risks, challenges, and opportunities facing AAPI youth." 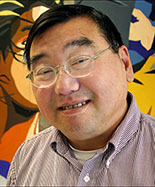 Authors: James Diego Vigil, Tomson H. Nguyen, Jesse Cheng, Thao N. Le, Judy L. Wallen, Ahn-Luu T. Huynh-Hohnbaum, David Tokiharu Mayeda, Lisa Pasko, Meda Chesney-Lind, Isami Arifuku, Delores D. Peacock, Caroline Glesmann, Deborah Woo. "AAPIs and Cultural Institutions," features how organizations like museums, traveling exhibits, performance troupes, and libraries represent AAPI communities and their diverse experiences. "Incorporation of AAPIs individually and organizationally by this nation's cultural sector can lead to political complacency and isolation from the broader social movement long before the ultimate goals are achieved," the editors write. "The larger challenge before us, then, is renewing the passion for progressive social change." Authors: ShiPu Wang, Clara M. Chu, Todd Honma, Leslie Ito, John Rosa, Lewis Kawahara, Nadereh Pourat, Ninez A. Ponce, Roberta Wyn. This issue features research on how Asian American communities are affected by and respond to policies related to welfare reform, healthcare, education, and art/cultural institutions. According to outgoing Senior Editor Paul Ong, a common thread among these articles is the commitment to building bridges between the university, AAPI communities, and the larger society. Authors: Linda Vo, Chong-suk Han, Edward Echtle, Evelyn Blumenberg, Lily K. Song, Paul M. Ong, Julian Chun-Chung Chow, Grace Yoo, Catherine Vu, Lois M. Takahashi, Michelle G. Magalong. 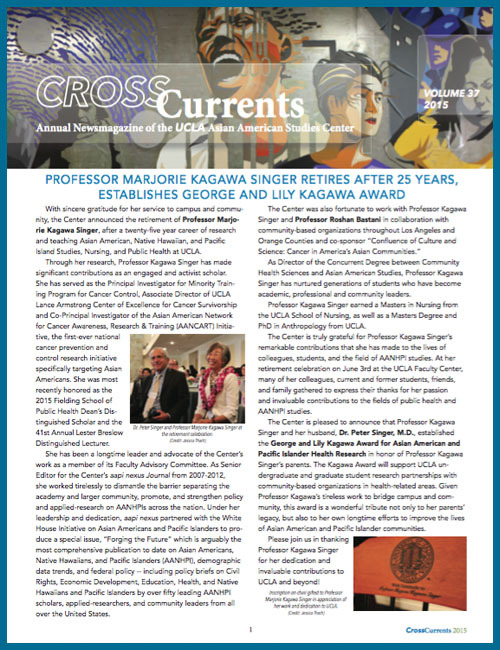 In this inaugural issue of the new Senior Editor, Majorie Kagawa-Singer, Nexus presents five articles that explore the diversity within Asian Americans and Pacific Islanders, including the disparities that continue to mark some of their experiences. These articles address the diversity within the AAPI communities that are often dismissed due to the model minority myth. They also help to develop new ways to intervene and prevent other pervasive problems from increasing in these communities. Authors: Paul M. Ong, Melany dela Cruz-Viesca, Don T. Nakanishi, Su Yeong Kim, Aprile D. Benner, Rena Mae Nalani Reid, Kathleen Ongbongan, Donna Dennerlein, Deborah K. Spencer, Robyn Greenfield Matloff, Drug Brugge, Angela C. Lee, Roland Tang, Jeanne Shimatsu, Eric C. Wat, Camillia Lui. With an ever growing number of older AAPIs, these older adults face additional challenges such as higher poverty rates among all older adults in the United States, lower rates of having private insurance, and many unmet mental health needs. Because of the challenges that aging populations pose to social policy, these papers help shape future culturally sensitive programs and services to AAPI elders and families. Authors: Herb Shon, Ailee Moon, Jong Won Min, Siyon Rhee, Phu Phan, Jessica Rhee, Thanh Tran, Poorni G. Otilingam, Margaret Gatz, Sela V. Panapasa, Voon Chin Phua, James W. McNally. The first of three issues on education, this issue focuses on K-12 education. With significant economic struggles and budget cuts in this new decade, these issues will help to inform the education policies and changing AAPI populations. As guest editors Peter Nien-chu Kiang (University of Massachusetts Boston) and Mitchell J. Chang (UCLA) write, "Asian American and Pacific Islander communities have individually and collectively invested enormous trust in US educational institutions on behalf of themselves and their children." Authors: Patricia Espiritu Halagao, Allyson Tintiangco-Cubales, Joan May T. Cordova, Leena Neng Her, Valerie Ooka Pang, Phitsamay Sychitkokhong Uy, Jean J. Ryoo, Lusa Lo, Joseph Wu.